The MPS Gaussometer is a rugged, hand-held, analog gauss meter designed for measuring magnetism in the field. Prior to developing the Gaussometer, MPS engineers had years of experience with several types of analog and digital gauss meters which were found either hard to read, or large and cumbersome. This is why Magnetic Products and Services developed a durable, yet portable and easy to use analog gauss meter that has the accuracy of a high-performance laboratory instrument. The MPS built Gaussometer and probes are made with the highest quality materials to ensure long durability. Past experience with other gaussmeters requiring frequent probe replacement proved to be not only inconvenient, but costly. To reduce unnecessary probe damage, Magnetic Products and Services developed a flexible and resilient DC probe made of fiberglass. This probe, referred to as the DCP/GR DC Hall effect probe, will give you easy access into tight areas that in the past may have been difficult if not impossible to reach. 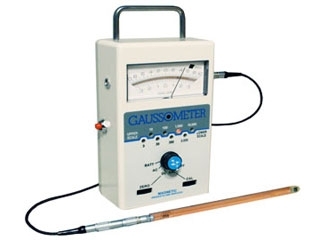 The MPS Gaussometer is available with AC Gauss, DC Gauss, and AC milliGauss probes. Model GM-X, for example, includes a AC gauss coil probe for measuring alternating magnetic fields and a DC Hall effect probe for measuring direct magnetic fields. For the price, the MPS Gaussometer is the lightest, most accurate, and easiest to use gauss meter available. For more information, call the GAUSSBUSTERS at MPS, engineers are available to answer any questions or to help with any special needs you may have. Range Hold Switch: Disables automatic ranging and holds the current range. Size: 2¼" x 4¼" x 7½"
Power: 4 AA batteries with more than 100 hours of operating life. The AC probes are available in both milligauss and gauss ranges. The DC Hall Effect probes are 8 inches long (transverse orientation) and are made of a resilient, flexible fiberglass that resists damage even under the roughest of industrial conditions. Attach the DC Hall Effect probe (can be used with or without the 3 foot extension cable). To calibrate the meter, use the calibration number printed on the probe. Set the selector switch to the CAL position and adjust the thumbwheel until the analog meter registers the probe calibration number. Zero the GAUSSOMETER by inserting the DC Hall probe into the zero gauss chamber. Set the selector switch to the DC position and adjust the thumbwheel until the meter registers zero. Place the probe at the location to be measured. One of the eight scale LED's will illuminate and the meter will register the magnetic field reading. For example: when the 100 scale LED is lit and the meter is registering -5 on the upper scale, the meter's full scale is from -100 to +100, and the magnetic field reading is -50 gauss. Attach either a milligauss or gauss range probe and set the selector switch to the AC position. Place the probe at the location to be measured. One of the eight scale LED's will illuminate and the meter will register the magnetic field reading. For example: when using the milligauss probe, if the 30 LED is lit and the meter is registering 1½ on the lower scale, the meter's full scale is from 0 to 30, and the magnetic field reading is 15 milligauss (or gauss when using the gauss range probe). Set the selector switch to BATT position, and the meter will register the battery voltage. (Company Name) in Pa. ... Please provide an updated quote for this unit. - Frank N., Senior Manufacturing Engineer of Global Turbomachinery Corp.